Beervana 2014 took place in Wellington over the weekend. My son and brewing buddy, Jimmy, and I went along to represent NZ Life & Leisure in the Media Brew competition. After letting his stomach settle, he wrote up the following guest blog. My usual experience of the Westpac Stadium concourse is the traditional half-time queue for hot chips and Tui, served in paper punnets and plastic bottles. It goes well with a game of rugby – and the concourse can be a welcome break from the swirling stadium wind – but it’s hardly a taste sensation. So it was a welcome surprise to walk in through the ticket gates on Friday and be confronted with a fairground of elaborate and colourful stalls set up the country’s craft brewers (and a few from overseas). Beervana has been going on for a little while now – 13 years in fact – but this year was my first one. Getting the chance to help out Mike Neilson of Panhead in the Media Brew competition was the perfect opportunity. By opening day, we’d brainstormed our spring-themed entry, brewed the beer, done the photo shoot for Life & Leisure, and even come up with a suitably automotive name for our ewes milk wheat beer: Lamb Chopper. I just hadn’t tried it yet. But before sampling our creation, there was a festival to check out. Ben Love, from the Gigantic Brewing Company, explained that the city of Portland is actually known as “Beervana”. There are 57 breweries in Portland and 77 in its wider metropolitan area – all that for a city about the same size as Auckland. Ben explained that in Portland turning up at a party with craft beer is the norm and that Portlanders know and frequent their neighbourhood breweries. Each brewer presented a beer, along with a matching dish prepared on-stage by the chef. My pick of the three was the Nova Pacifica, brewed in collaboration between Commons Brewery and Tuatara. The two ends of the Pacific came together in the mix of Nelson Sauvin hops and Oregon Meridian. It was a fresh, fruity and strong ale – Commons are known for their Farmhouse Saisons – and went down well as the first drink of the day, accompanied by a Kingfish salad. The craft beer market in the States is booming, but fierce competition for taps keeps the brewers innovating. So, what’s next in the world of craft beer? Joe Casey, of Widmer Brothers, predicts the rise of lagers. Hopped-up pale ales have ruled the craft beer world for long enough: “Sometimes people want a beer that’s not going to rip their tongue off when they drink it.” The goal is to convince people that lager is more than just a mild, crisp beverage that comes in a green bottle. And when you needed something to line the gut, the food on offer was a step above the stadium’s usual pie+chips combo – I’ve heard the pulled pork from Grill Meats Beer was a highlight for many, but I can’t imagine a much better match for craft beer than the pork buns, hot off the spit, from Big Bad Wolf. The most adventure to be had was down in the Harbour Zone at the Media Brew bar. There were some truly weird creations. ParrotDog added lamb bones to the boil to create their Dogbone and topped it off with add-your-own fresh thyme. The beer’s bark was probably worse than its bite: it had the deep brown colour of gravy but its taste was more subtle than I expected. Monteiths chose sweet over savoury. Their creation was labelled Raspberry Lamington Wheat Beer and tasted like someone had been particularly generous with the raspberry milkshake syrup. But the beer I’d been itching to try was our Lamb Chopper. Poured in the glass, it had the pale cloudiness of a wheat beer and the citrusy hop aroma matched the spring theme. On the palate, the spicy, clove flavours kept the beer interesting. But what about the secret ingredient, the ewes milk? The beer, fortunately, didn’t taste milky beyond a slight sweetness and a lingering coating on the inside of my mouth after I finished my first mouthful – just like you get when you drink a glass of cold milk. Lamb Chopper didn’t win a prize (robbed!) but the judges enjoyed its colour, cloudiness and farmyard nose. The bottled special edition is currently being rolled out, finished with a drawing of a ram on a motorbike by Simon Morse (the tatooist). Thankfully, it’ll be in bars soon – I haven’t been weaned off it yet. Only two sleeps until Beervana and the launch of what I’ve been excitedly calling ‘my beer’. 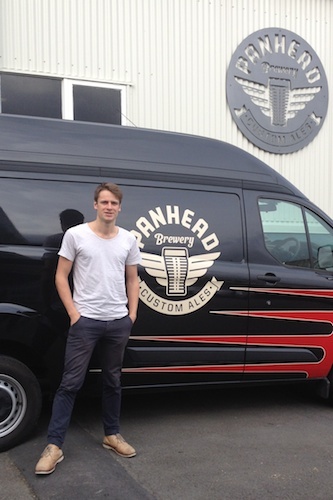 It is in fact a collaboration between Panhead Custom Ales and NZ Life & Leisure magazine, one of twenty-five entries in Beervana’s hotly contested Media Brew competition. I’ve been itching to take part – “pick me, pick me!” – since the event started some three years’ ago. This year, I was not only one of the chosen but I was able to pick my brewer. I entered the event with my son Jimmy (my homebrew partner) and I opted for MIke Neilson at Panhead because his Upper Hutt brewery is a driveable distance and because Jimmy and I really like his beer. I’ve written Mike up in the next issue of NZ Life & Leisure (Sept/Oct) in an article about my – I mean our – beer. The ground rules of the competition are reasonably open to creative interpretation. The theme changes each year – this year’s it’s Spring – and the brew must include an “intrinsic New Zealand ingredient”. Last year’s winning beer contained red, white and green jet planes; this year I’ve heard rumours of karengo, sea water and horopito. Our own brew is now kegged up and ready to go, so – having managed to keep it a secret so far – I’m ready to spill the beans. A couple of weeks ago I received a box full of Fairtrade and Trade Aid food products as part of the Big Fair Bake campaign. I was surprised at the range of ingredients, given that it wasn’t so long ago that Fairtrade was limited to coffee, chocolate and bananas. My box contained Palestinian almonds, Medjoul dates (the best kind), cocoa, chocolate, coconut milk, raw sugar, bananas and cinnamon. My mission was to bake something that included some of those ingredients. I decided to experiment with Florentines, partly because I’d never made them before and also because I wanted to make use of the dates, chocolate and almonds I’d received. I spent a morning devising a recipe and discovered that these delicious Italian biscuits deserve their reputation for trickiness. Florentines should spread themselves thinly; they should be chewy in the middle with lacy edges that are crisp to the bite. 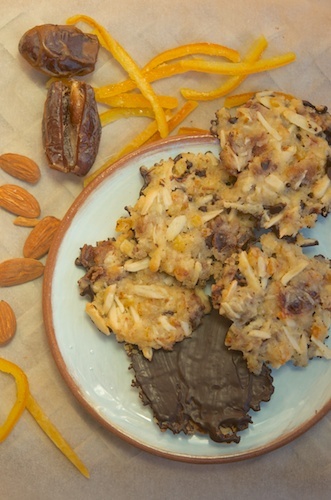 My first batch resembled flat rock cakes with too many nuts and not enough fruit, so I cut back on the flour, reduced the almonds and added more candied orange peel. This second batch was really good – my family scoffed the lot before I could get them into the tin. Just as well – Florentines should be eaten fresh before they lose their crunch. My recipe is on the blogger page of The Big Fair Bake website, click here. I recommend making your own candied orange peel; it’s not difficult and it tastes so much fresher than those packets of mixed peel that gather dust in the back of the pantry. I’ve included the instructions with the recipe and I’ve also explained how to blanch and skin the whole almonds. You could, of course, buy them already skinned and slivered but then they wouldn’t be Fairtrade and that would defeat the whole purpose of the bake off. I think as consumers we should make the ethical choice and buy fairtrade ingredients where we can. By doing so we return a larger profit to the farmers who generally get paid less than anyone else in the value chain. It’s the least we can do. Visit the Fairtrade Facebook page to win prizes in the Fair Bake competition.